Although a great percentage of the present day population speaks more than one language, a smaller number are early bilinguals, in the sense that they are speakers who have grown up with two languages since childhood. The present thesis on early Dutch-German bilinguals addresses the question as to what it means to be such a speaker. It presents insights gained by language production experiments into conceptualization processes during language use by Dutch-German bilinguals, with a specific focus on cross-linguistic differences between the two languages. 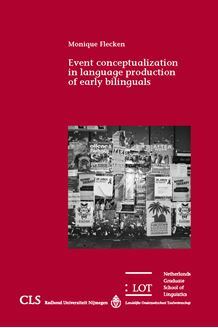 The findings show that in the domain of event construal, the bilinguals adhere to principles that differ subtly from those of ‘monolingual’ speakers of both languages. To be more specific, the acquisition of two patterns of ‘Thinking and Seeing for Speaking’ (cf. Slobin, 1996; von Stutterheim & Nüse, 2003) results in bilingual-specific performance patterns in language production that reveal bilingual-specific language processing mechanisms. The findings are discussed in light of conceptualization preferences that indicate a reliance on core linguistic principles that overlap between Dutch and German, coupled with a reliance on basic, simplification strategies. The studies collected in this thesis make use of several psycholinguistic research methods which further support the results of the production studies, i.e. eye tracking measurements, acceptability judgements and an experiment involving processing constraints.